Whether using an eyelet as a vent, a hole support or a drawcord port, YKK's eyelets with a compression washer ensure the highest quality attachment over a wide variety of applications. From delicate fabrics to thick webbing, secure attachments can be achieved with YKK attaching machines. 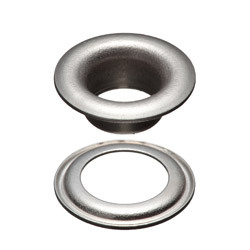 Made from a base material of solid brass, these eyelets can be finished in wide variety of finishes.